A Visual Bio is like a resume or a curriculum vitae but done in a visual way. 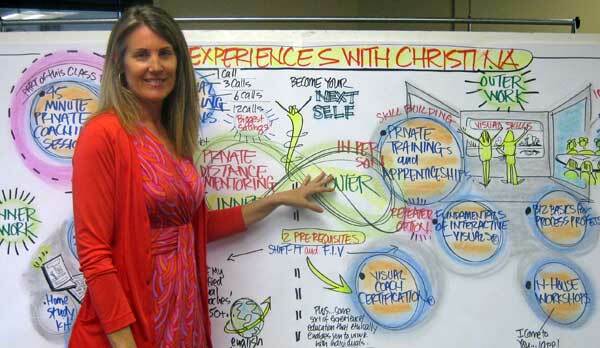 In my case, it’s in the graphic facilitation style that I’m known for and train others in. A Visual Bio is a summary of your professional identity and the story connected to it (more personally oriented summaries are called Life Maps). That you use to communicate that story effectively to others. Visual Bios tell the tale of who you are and how you came to be that … they provide the evidence base for your role and brand. And, if you are like me, they can communicate information about yourself that you might otherwise have a hard time doing. At times I find it embarrassing or awkward to talk directly about myself and my accomplishments. It can feel too “me, me, me” which as a facilitator-type is difficult (as we are usually about you, you, you). However there are occasions where it is important to demonstrate my credentials and legitimacy. So, my Visual Bio helps me talk about myself, sometimes without me ever having to say a word. It also demonstrates the visual way that I usually work in too. 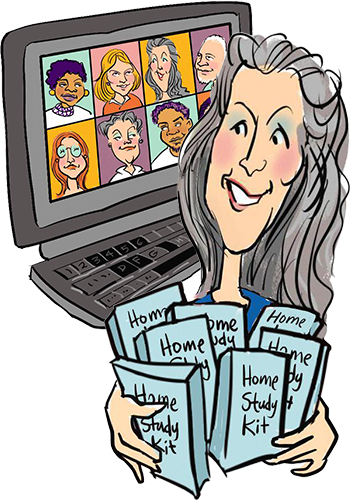 Below are examples of Visual Bios (my own, some I’ve created for others, and a few from my students) and a video clip of me using my Visual Bio during an online class … to give you ideas of ways to engage these useful tools. This is my larger Visual Bio, I created it years ago (cobbler’s kid … really need to update!). I use it on my websites, in client proposals, during my online and in-person classes, and occasionally in facilitation gigs. This is my smaller Visual Bio, when I want to establish credibility quickly or don’t have much time. 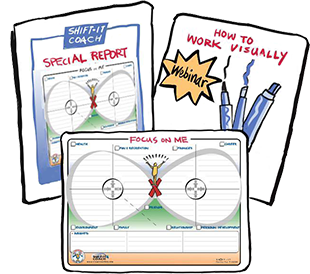 Check out Certified Visual Coach Sue Keely’s Graphic Resume offering. And grad Jocelyn Ring uses her Visual Bio to good effect on her website. 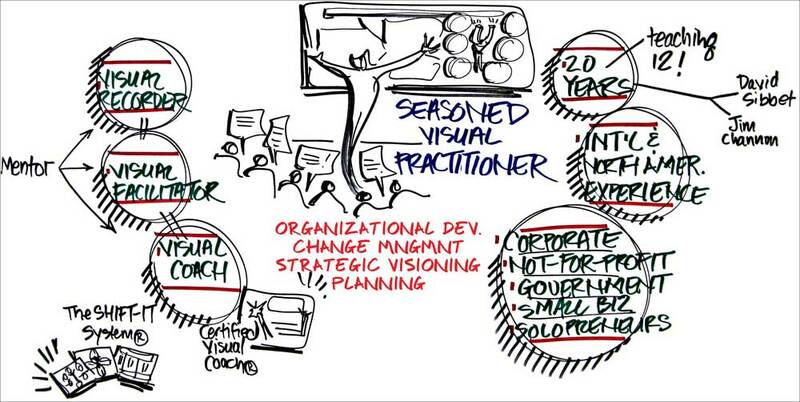 We often discuss Visual Bios in my Fundamentals of Interactive-Visuals and Magic Marker Retreats. They are a natural portfolio piece for Visual Practitioners and are often on the Game Plans that my students create for themselves about their next steps. A Visual Bio is a marketing and positioning tool. When you create your Visual Bio it’s important to get as clear as possible about the intention of your bio (what you want it to do for you). And to whom you will be presenting it to (the audience). You may find, given your background and the kinds of opportunities you are now interested in, that you have several versions of your bio (that position you best for different purposes). I have found, in creating Visual Bios and guiding others to create their own, that it’s best to take a ‘software approach’ to them. Kick out a quick ‘Version 1.0’ and test-drive it for a while. You will learn over time how that particular version serves you and what needs to be tweaked in order for it to serve you better (version 2.0, 3.0, 4.0) etc. Are people getting it? Where are the confusion points? Have you left out something important? If you don’t like how it’s being interpreted then back to the drawing board to the find the language and accompanying visuals that do a better job. FYI, your Bio will also need to be updated over time, to reflect your ever evolving self. Do you have a Visual Bio? If so, upload a pic or share your URL below … as its nice to have a range of bios to consider. Thanks for the “shout-out” Christina!